We are in the spotlight! 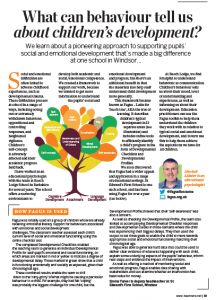 Fagus is highlighted in a recently published news piece in Teach Primary’s SENCo Magazine. It’s a great article that outlines how our pioneering approach has helped St Edwards First School integrate a new understanding of social and emotional functioning into their provision. Why don’t you take a leaf out of St Edward’s book? You can read the full article here. We have a growing network of Fagus users from a really varied array of settings using the framework in a variety of different ways. Amongst them – PRUS, Behavioural Support Units, Residential Schools for LAC, Adoption Services, Educational Psychologists, Virtual Schools, Specialist SEN schools, State and Independent Primary and Secondary schools and therapeutic interventions.